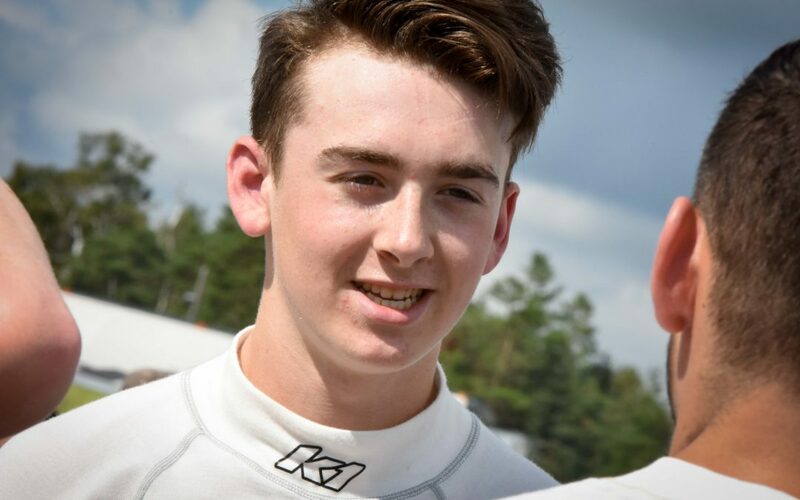 Having profiled a pair of BGR rookie drivers and a newcomer with FRS, this week we have a returning driver to the Toyo Tires F1600 Championship grid – Zachary Vanier. Once again committed to Britain West Motorsport for a full season of racing, the sixteen-year-old from Northern Ontario will surely be a contender for the title this time out. After finding his feet through the first half of his rookie season, he ended his year on the top of the box at Tremblant, and will be looking to take up right where he left off. How long, and what, have you raced? I started racing at the age of 4. I was racing snowmobiles from age 4-12, and when I was 10 years old my dad got me into karting. I did Briggs & Stratton along with Rotax, and competed in the Canadian Nationals, Eastern Canadian Karting Championship, Ron Fellows Karting Challenge and many club races. I started racing F1600 at the age of 15 with Britain West Motorsport and now, at 16, am returning for my second year of it. This past winter I also competed in ice racing with the Lexus Sport Cup, which was a blast. Why racing? How did you get into it? I got into racing because of my dad. When he was in his 20’s, he competed in snow cross a lot. Then, once I was old enough to race, we went and bought a sled for me. I love racing because it really gets the adrenaline pumping and it’s really unique, not too many people get to say they race a car going 200km/hr, or even faster. What was it like to be a rookie last year in 2018? What did you think? Going into the season there were really no expectations from anyone, I was just going out there and doing the best that I could. We definitely achieved things we didn’t think we would in my rookie season, many podiums and a win, Rookie of the Year in Quebec and Most Improved driver in Ontario. I think it was a great season and now I look to build on that success this coming season. What is your # and why did you choose it? My number in F1600 is 65. The reason I chose that number is because David Clubine told me that this number had great success and achievements for Britain West Motorsports and I look to continue with that number and follow in their footsteps. What track raced has been your favourite? My favourite track I’ve raced on so far has to be Sebring. It’s a very high speed/technical track, 8.4km long with 17 corners and multiple straightaways. It gives you a feeling for being both technical and fast, which every driver loves. I also won my first race the first time I raced there, so maybe that’s also why it’s my favourite. What track would you love to race around? The track that I would love to race around is Road Atlanta. Everyone in the racing world has told me it’s a track you must compete on, with some scary corners and also very high speeds. Lucky enough for me, I’ll get to compete there this April. What is your greatest racing memory, either as a driver or spectator? My greatest racing memory would have to be when I got my first win in the F1600 at Mont-Tremblant. This one was so special because we had been so close to my first win all season. The best part about this win was that at 4:50 in the morning, on the day of the race, I received a text from Bertrand Godin saying, “Today is your day. Enjoy Zachary!” Then we went out that afternoon and won the race. It was amazing and something I’ll remember forever. Who is your favourite driver from any generation and why? My favourite driver from any generation would definitely be Sebastian Vettel. He’s my favourite because he drives for my favourite team, Ferrari, but he also loves to give back to the community. He stops to give autographs and you see him walking around the track with a smile on his face. I also think that Sebastian and I have similar driving styles. He’s had so much success, winning four championships in F1, and he’s someone I’ve looked up to since I started racing. My goals for 2019 would be the following: Win the F1600 championship, earn the Road to Indy ticket, win the Canadian scholarship to represent my country in the Formula Ford Festival, do well at the run off’s at VIR, and give my team and sponsors the results they all deserve.